It is no secret. I am a nacho fanatic. Some people say, "oh chocolate is my weakness" or "I just can't live without my bowl of ice cream every night". Not me. It is nachos. I of course don't eat them every night or even every week but they are my happy place on a plate. Cheese, meat, tomatoes, onion, avocado, sour cream, salsa, more cheese, MORE sour cream, MORE guac......my mouth is watering. Anyway...the point is, I consider myself a bit of a nacho snob. I like what I like, and by the way, don't try sneaking in beans of ANY kind, no olives either, you got it? I decided I wanted a dip, a dip that embodied all that is "nachos". I mean I wanted to dip a chip in think to myself, "omg this tastes like a chip full of nacho stuff". Do I think this recipe is probably the first of its kind, probably not. But it is the first of its kind in my world. I have had 1,000 variations of this dip but my combo rocks. It is 3 ingredients, and you are done. Awesomesauce, eh? 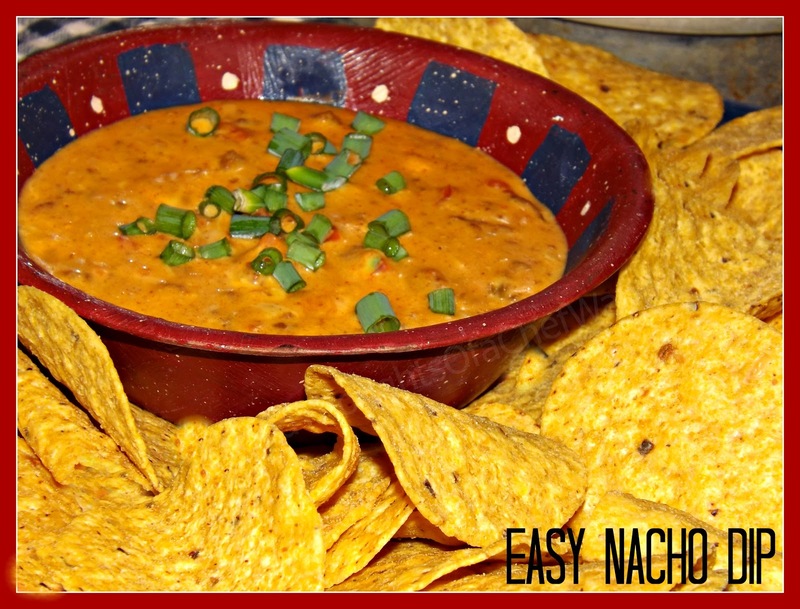 With the Super Bowl upon us, which of course I won't be watching, I just thought it would nice to give guests those nachos they are so hoping you will have, without all the bother of all those toppings! in fact, I think it is likely you may have everything you need in your pantry already for this recipe! 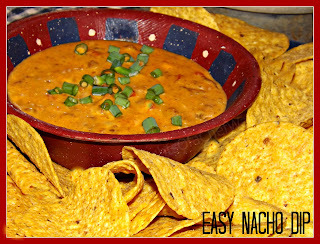 So here it is, my EASY Nacho Dip! Heat all ingredients on low until cheese is melted. EAT. I suppose you could also put this in a crock pot. Yea, you could! I would say it won't take much time and to be careful you don't overdo it. Use one of those small crock pots maybe to keep it warm during the game! Really accurate info there eh? See how easy this is? I wasn't kidding. And for the record I tossed the cans before I looked at the ounces. Just use the standard size, not the jumbo's or tiny ones. You will want to make a double batch because we have been eating on this for 3 days now and it is better than it was the first day. No seasoning, no spices, no fussy, mussy, stuff. It is so good, cheap and cheerful too! Thank you for linking up at our Ladies Night Celebration . We hope you come back this week and share your favorite cocktails, appetizers and treats!! !